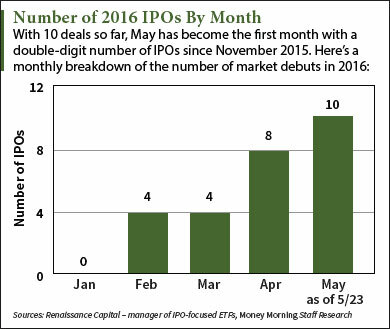 The IPO market is about to have its busiest week of 2016. Six upcoming IPOs are on deck this week, which will bring the May IPO total to 16 and make it the busiest month since October 2015. According to Renaissance Capital, a manager of IPO-focused ETFs, the six deals on this week's IPO calendar are expected to raise a combined $1.59 billion. U.S. Foods is the second-largest foodservice distributor in the United States behind SYSCO Corp. (NYSE: SYY). Founded in 1853, the company distributes its food to over 250,000 customers nationwide, including restaurants, college dining halls, hospitals, nursing homes, and hotels. According to the SEC filings, it has 62 distribution centers and roughly 6,000 delivery trucks. The U.S. Foods IPO will be the second-largest IPO by deal size of 2016 so far. With $23.2 billion in sales last year, it will also become the biggest offering by sales since 2013. The deal will raise $1 billion by selling 44.44 million shares at a $21 to $24 price range. The firm is valued at $4.9 billion and will start trading on Thursday, May 26. Cotiviti Holdings Inc. (NYSE: COTV) is a payment company for the healthcare sector. The company was founded in 1979 and offers payment analytics and audit services for major healthcare providers across the United States. For a healthcare-related company, Cotiviti has strong earnings with more than $550 million in 2015 sales. But the firm will need to keep expanding its customer base to maintain growth in the uncertain healthcare market, which is down 4.8% this year. The Cotiviti IPO is set to raise $225 million by offering 12.5 million shares at a price range of $17 to $19. The company commands a $1.7 billion valuation and will hit the market on Thursday, May 26. Gypsum Management and Supply Inc. (NYSE: GMS) is the largest independent provider of ceiling, wallboard, and drywall systems in North America. The company controls roughly 13% of the building materials market. According to Renaissance Capital, GMS raked in $1.7 billion in sales between January 2015 and January 2016. Its debut follows competing landscape supplies firm SiteOne Landscape Supply Inc. (NYSE: SITE), which went public on May 13. GMS will generate $154 million by selling 7 million shares for $21 to $23 each. The company is valued at $896 million and will debut on Thursday, May 26. Midland States Bancorp Inc. (Nasdaq: MSBI) is an Illinois-based bank chain with 81 branches and nearly $3 billion in assets. The company originally filed to raise $101 million but announced today (Monday, May 23) that it's reducing the deal size to $89 million. It will raise the proceeds by offering 3.87 million shares at a $22 to $24 price range. Midland States Bancorp has a $399 million valuation and will go public on Tuesday, May 24. Reata Pharmaceuticals Inc. (Nasdaq: REATA) is set for a $60 million deal by selling 4 million shares at a price range of $14 to $16. The hypertension biotech will begin trading on Thursday, May 26. Clearside Biomedical Inc. (Nasdaq: CLSD) will raise $60 million by offering 4 million shares at a $14 to $16 price range. The eye-related biotech will debut on Wednesday, May 25. Alex McGuire writes about upcoming IPOs for Money Morning. Follow him on Twitter for updates on the six IPOs this week. Thanks for the info on us foods. Heard it here first!! !